Just because you've done a good job showing up in SERPs and a person visited your website does not mean that person is ready to buy anything from you. At least not yet. Trying to sell and survive in a B2B world is not a sprint, but a marathon, and having them come to your page and consume some of the content there is literally just a step in the right direction. It is a long-term game that requires building trust and nurturing a relationship with prospects. (visitors who were never potential.. Contemporary startup ecosystem may seem like a “schizophrenic” jungle – overflowing with creative juices in one part, only to be bordered by cash-starved deserts of reality in the neighboring one. The reason for this are varied, chief among them being tight budgets that run out of steam before a business idea manages to grow some roots. That’s why startups try to come up with growth hacks that will allow them to achieve as much sustainable growth as possible before the cash fizzles out. One..
Update: we just published a new comprehensive guide for marketing your SAAS product, go check it out! I speak with many B2B CMOs who tell me online marketing isn’t relevant when it comes to B2B. Such companies stick to traditional methods such as trade shows, cold calling and god forbid – traditional media such as billboards or even TV. SaaS marketers don’t have the privilege of disregarding online marketing as a core platform for generating customers. By the inherent online SaaS nature,.. Following our release of the 2017 State of Marketing Automation report, we were approached by The Telegraph UK and invited to take part in their digital transformation campaign alongside titans such as VISA, IBM and EMC. Humbled and honored we accepted the invite, jumped on a plane to royal London, and gave them our 2 cents on how to create the perfect B2B campaign. Facebook just introduced a new video watching service and considering the direction the internet has been taking in the past couple of years, it shouldn't come as a big surprise to anyone. Before we dig into why I think it's a logical step forward for Facebook, let's first take a look at what this new feature actually is and how it operates. Over the past few months, we've teamed up with competitive intelligence and lead generation provider SimilarTech to conduct research on the trends that shaped the marketing automation landscape in 2016. Following our Hubspot Inbound Growth Story Impact Award win, the Hubspot team asked us to create a video that will be featured on our Hubspot impact awards page and details the winning story of who we grew our client BusinessBlocks' business by 600% in 6 months and helped them get acquired by a publicly traded company all using HubSpot and amplified Inbound marketing services. So we did. We have great news to share! 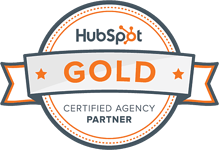 We won the Hubspot Inbound Growth Story Impact award! The Inbound Growth Award recognizes an agency that helped a client experience rapid growth with Inbound Marketing practices. We're all feeling very proud – our submission received 91 out of a possible 100 points.